When quality counts, the preferred choice is Avery DennisonTM hand labeling systems. 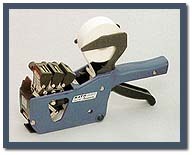 Western States Supply Co. offers a complete line of hand labeling tools, complemented with a comprehensive variety of stock and made-to-order labels for most applications available in standard adhesives including permanent, removable and freezer. 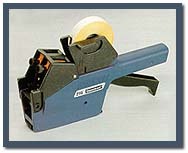 We also stock a number of these labels with tamperproof cuts responding to needs for security and loss prevention. We can deliver labels manufactured to fit your business needs whether it is price marking, product identification, date coding or maintaining standard of traceability. 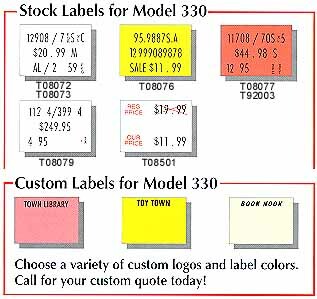 We can provide our labels in a variety of colors, materials and adhesives. Expect the best from the label experts. 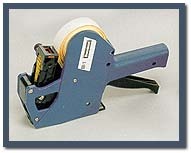 We have a complete line of one, two and three line portable marking systems and a comprehensive line of stock labels. 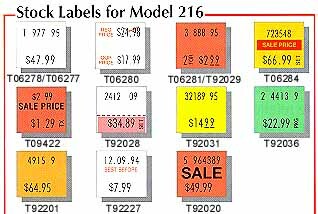 Whether you're price marking, date coding, or process controlling, we have the right label for your application. Custom labels are always available upon request. Let us show you more about what products are available in your market. Also available: Monarch, Meto, Garvey and other major brands. Prints 1 line, 8 characters. 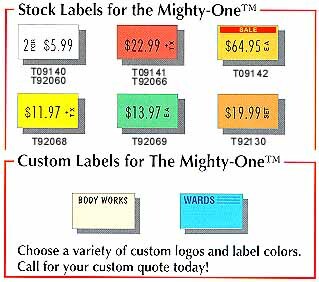 The Mighty-OneTM Hand LabelerOffers the best print quality available. * Rolls, sleeves and carton quantities may vary. Prints 1 line 6 characters. 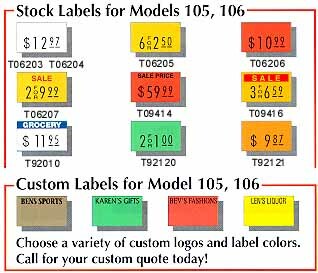 Prints clear, crisp prices on a variety of stock labels or custom labels; you choose the format. Prints 1 line, 6 characters. Big print on a small label. Perfect label size for any application. Prints 2 lines, 10 characters per line. The retailers choece for general price marking, SKU control, department identification, cost coding and season coding. Prints 2 lines, 8 characters per line. 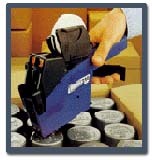 This versatile tool is ideal for price marking and product identification. Suitable for avariety of applications. Tinted (bottom) red Promo Perf. Prints 3 lines, 10 characters per line. 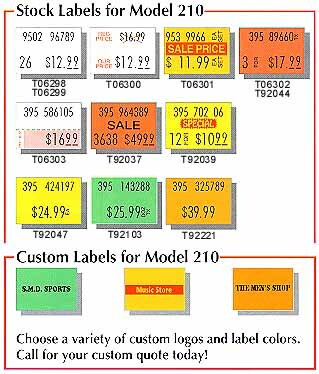 Print all the information you need on one small label..
"REG PRICE" and "OUR PRICE"